ugh, very bad southern comfort (non-)memories. don't think i will touch that again so long as i live. same with rum (why couldn't i have been sensible and just drank american "beer"?) i'm not a fan of sweet liquor anyway. I was never a big fan of southern comfort although (in my bar competition days) I did start making martinis with southern comfort instead of vermouth. It was relatively popular for a while. American style pale ale is typified by the use of cascade hops which give it the astringency as well as the almost fruity flavours. However little creatures is rated very high in the same style, usually beats sierra nevada in competitions. From memory the fat yak was a bit more malty than the little creatures. Kind of like matilda bay seemed to do an over the top version (alpha ale) and a toned down version (this one). My brother spruiked me silly about little creatures. I promised myself I would finish the mountain of beers in the store room before I was allowed to buy some, hence the recent drunken babbling. never had fat yak (with a name like that i would've remembered!) but i did consume many gallons of sierra nevada pale ale when i was in calif. it wasn't nearly as expensive as little creatures, though, since i was but a poor grad student at the time and still managed to kill plenty o brain cells with it. a very good brew for the price. i think the west coast has a much broader selection of beers than the east coast - i spose micro brews are more popular (both as businesses and potables) out there. 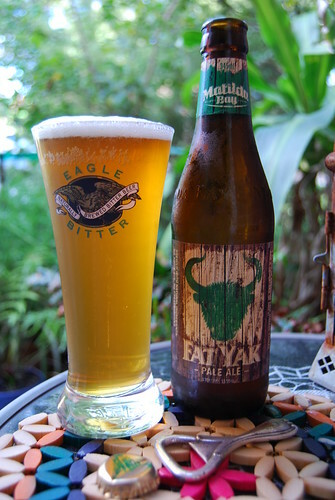 Fat yak is available in Canberra urch. Both at the civic hotel and king o'malleys. Of course you may be a wig and pen man. Ahhh, beer ratings. Like stock ratings, risk ratings, wine ratings, standard of living, restaurants etc. Worthless fluff for the masses, where no one is contrarian, always fall in with consensus. I'm self flagellating for wasting a joule clicking on a ratings link. I've lost count of the lowly rated (wine, restaurant's, beer, scotch, bonds, currencies, etc) which I've found superb and and the highly rated that have proved rubbish. Keith's is not very bitter for an IPA nor as bitter as FY. I think the commonality I was seraching for is the yeasty after taste like Cooper's Sparkling. Why is Fat Yak out of the keg cloudy and clear out of a bottle? Totally agree to a point, some of my favourites are favourites for reasons other than technical flavour points (Tui would be a good example, technically it is a crap beer in the same league as VB, tooheys and other mass marketed swill). And, in fairness to the site, you will see an awful lot of people talking about session beers, Fat Yak was one. Whilst at an intellectual and respect of craftsmanship a big old angry beer is absolutely amazing you just can't drink many of them. Most of my highest ranked beers are really in the 1 or 2 at a time type area. Too much flavour, too much alcohol etc. When they talk about session beers they are talking about a beer which you can have a good sit down with some friends, talk sh*t, lie desperately and do it for a couple of hours with all the bonhomie associated, fat yak I think is considered one of those. To correlate with scotch (which you are probably more of the same mindset), Lagavulin is absolutely great but it is also way over the top in flavours and probably shouldn't be your drink for the whole night, moving to something like Scapa or a lighter highland style is probably going to be enjoyable. 1. The cellarman doesn't keep his lines clean, you will normally notice this very quickly from the musty evil smell in the glass. 2. the beer is "on lees" meaning they don't completely filter out all the yeast. A few beers do this as it helps the beer age in interesting ways, some home brewers build their yeast starters from "live" beers like this. Mostly it only happens with your maltier beers (lagers and pilsners don't tend to age well). From a keg is fairly unusual in this country, Coopers would be the only one where you regularly see super cloudy at the end of a keg. There are two venues locally that have the Yak, both a bit up market and its cloudy in the Coopers style. The photo on the website is cloudy as well ( http://farm4.static.flickr.com/3337/3493342274_38dbb8a67b.jpg ). Yes regarding flavours, I need big flavours (which is why the Belgian Monk beers are faves) so I'm probably not a critic worth noting. Maybe I should just filter ethyl alcohol through some yeast. He he, I didn't realise there was another kind. I wanted to take this shop home with me... so many beers, so little time. The male/female dichotomy in beer ad technology. When asked for a drink. Is it just me or is Crown Lager the most awesome session beer ever? I can drink the stuff like it's water and carry on all night. Not heavy in the stomach, not too bitter or too sweet and enough alcohol to make me suitably silly after a while. I've had a couple tonight and it's very tempting to flatten the rest of 'em but I need to pace myself because tomorrow is going to be a big one. Well TBH crownies are what bogans drink to feel posh. I think it's the taller bottle. Having said that melbourne bitter is my session beer of choice. While draped in the flag tomorrow at a barbie it's what I have planned. I probably tick the bogan box but I drink it because I don't get all fat and bloated and I can keep drinking them all night rather than to feel posh. I get full on most other beers after a while and have to hit the spirits. You're probably onto something with the bogan theory; I have a relative I'd rather not and he usually has a few Crowns around the place (and isn't shy to help himself to mine). Crownies are great. Totally tasteless Ice cold swiggers when hot. The rest taste awful when not ice cold. The same when icey. 12 guys in a shout at a sesh happy hour, combined income $2M pa, a latecomer, what are you having? Whatever's on the go in the jugs. Another occasion, discussing the smoke in Talisker or rejecting the tannins in a Pepperjack (?). Ages since I had a crown. Back before Chuck Hahn tried to bring some decent beers to the aussie mass market (Hahn premium, James Squire etc) it was fairly popular. I don't think it uses Pride of Ringwood hops which I think is what gives most of the others their metallic aftertaste. When Hahn premium came out it took over the place of "Cold, low taste no aftertaste" beer for me. Then Chuck left Hahn and that went downhill pretty rapidly. Shortly after James Squire Amber Ale and Little Creatures became my session beers of choice but they are both pretty strong flavoured. Been drinking a fair bit of Brewdog recently. Their Punk IPA is nice if you are a hophead. The labels come off a little bit "we're eXtreme and cool and sh*t" but the proof is in the tasting. The Punk IPA has similar floral hops to Little Creatures but amped up quite a bit. There have been a few times when I have moved past them in the fridge because such a strong flavour was not what I was after. But they are good. Highly recommend grabbing a 4 pack (~$16) and having one.